If you are ready to lose the weight of discouragement and self-doubt, be sure to sign up for "The 7-Day Doubt Diet" in my sidebar. Filled with daily insights, powerful promises, and short scripture-prayers, Renee's written a week’s worth of FREE Confident Heart devotions! Do the 7-day Doubt Diet on your own or, even better, invite a few friends, co-workers, neighbors or family to join you in your journey of learning to live without doubt and find the assurance of a confident heart. The purpose of "The 7-day Doubt Diet" is to give you a week's worth of daily encouragement and practical steps to start losing the weight of self-doubt and defeat! These devotions include some of my favorite parts of A Confident Heart, and I cannot wait to share them with you! Also, I hope you'll invite a friend, neighbor, co-worker or someone in your family to join you. There's nothing like having each others prayers and encouragement when it comes to losing the weight of self-doubt! Do you want to join me in losing the weight of discouragement and self-doubt? 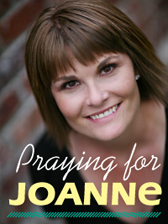 Renee Swope, from Proverbs 31 Ministries is offering a FREE "7-day Doubt Diet". Just click here to enter your information in her sidebar, and you'll receive a week's worth of devotions from her upcoming book, A Confident Heart. Let me know so we encourage one another the week they come out. Have you signed up yet? Be sure to let me know! This week, if you sign(ed) up and invited a friend (or two), click on the word "comments" below this post to let me know! You will be entered to win one of three more GoBible® Travelers I've been given to give away. I've extended the give-away through the weekend so be sure to check back Monday or sign up for email updates in my sidebar. And just in case you're wondering, A Confident Heart is being released August 1st but you can pre-order your copy today here. Count me in. Want to read the book also. Wow, over 45 of you had signed up by 8 o'clock tonight and more are coming in! So excited by your response. Working on details with my publisher and will send an email to you all on Friday. I am just reading my personal email! I would love to "lose a little weight" with you and the others ladies who are participating. Hi Renee, yes, count me in! Count me in, Renee, Sounds interesting. Hi Renee, This sounds like just what i need. I guess i just can't figure me out because i'm just as afraid "to be" confident as i am in not being confident. Doesn't make sense. I think maybe i long to be confident but, that means coming out of the safe little room i'm hiding in and that is really scary. It would be so nice to have the weight of the world off my shoulders. I will pray the Lord will provide a way for me to get the book if this is what He wants for me. I also pray that this will help and encourage all the other ladies that need this in their lives. Thanks Renee! Thanks for the opportunity to be part of the focus group! I sent an email, just wanted to say thanks here too. Can I still sign up....love...love to do this!! I am trying to lose this extra baby weight and so far 7 pounds off with many more to go!! Sign me up please!! I would love to take part in this if it's not too late. I'd love to read your new book. I've been through a lot lately. Sounds like just the words I need to hear. Thanks for your ministry. Love it!!! YES YES YES I would love to lose a little weight!! I would love to do this is it too late? to sign up? This books sounds great! I have been in countless situations that I am faced with doubt and frozen with fear! I would love to learn how to work through those tough situations and be victorious! I would like to win the books--Joyce - jaf1227@yahoo.com.....love to read inspirational and uplifting stuff! please include me. I plan on pre-ordering your book as well. Is it better to order it here, or at the Muskoka Bible Centre - women of grace retreat June 12th? Can't wait to hear your message! I'm in too! No doubt, self-doubt is the heaviest. I would love to lose the weight of self-doubt. That would definitely lighten up my life. Looking forward to your New Book! Thanks! God Bless You. I am in too.....and so ready for this new venture of NO DOUBT!!!! Thanks! Wow, do I need this!!! I just signed up today and am SO looking forward to having a great week of letting go! Just signed up. I am looking forward to this. Thank you! I can't wait to read the devotions! I'm excited bout the devotions! Thank you Renee! This is just what I need to get these last 6½ pounds off. THANK YOU for helping me on this journey!! To have the confidence to lose weight and keep it off!!!! and believe me, I have the weight to lose! I am definitely joining in! Thank you!! I would love to read your new book! I just signed up Renee! I am definitely tired of doubting myself! I hope it's not too late to sign up. I have already signed up for the devotions. Waiting expectantly to receive the devotionals. I am so tired of doubting myself and also self defeat. 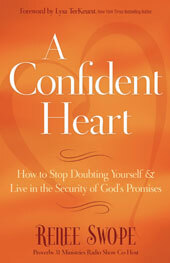 I need to have "A Confident Heart" and I think the devotions will jump start the journey. Thank you for the opportunity to sign up for the devotions and the chance to win! I have always lacked confidence and look forward to reading your book. I'm in. Thanks for the opportunity to win a GoBible. How I would love to win :) Have a wonderful weekend. God Bless. Signed up myself and invited some friends...sounds like just what I need in this season. Thanks for the chance. Just signed up! Looking forward to this opportunity! I'm looking forward to receiving the 7-Day Doubt Diet devotionals! Eager to see the 7Day Doubt Diet thanks! I can certainly use this book! I am definitely ready for this. I am attempting to post on my wall but We have too many characters 8) working on it. Just signed up. Thanks. Looking forward to your book coming out. Can't wait, sounds like jsut waht I need right now! Count me in as well! Tired of fighting the "doubt monster." Thanks for your uplifting and inspiring words. Would love to win your book! I'm in! Yeah!!!! I am so excited about this. I know I need this. I also sent this to my mom and 4 sisters. And can't way for the book God bless!!! Yes, I desperately need to "lose weight". Lately I have noticed I am carrying around baggage I did not realize I had picked up. I am looking forward to your devotional diet and reading your book. I have also invited a friend to join me. I would like to read the book when it comes out. I also would like to be counted in for the giveaway. I am signed up for the day devo session:) Thanks! I signed myself and my friend up. We work together and encourage one another - praying for each other and lifting each other up when needed. Can't wait to read and share your devotions with her. I have always been a doubting person. Your message about a Confident Heart sounds like something I need to learn to do. Yes I have signed up, the word confidence scares me and you read my mind about self-doubt, do it all the time when I feel I have made a mistake, replay it over. I signed up today and sent e mails to my friends to join too. We all need encouragement and I am looking forward to the 7 days. Please enter me into the giveaway. I signed up to receive the 7 day Doubt diet. Can't wait to read it! I would love to lose the weight of doubt and have invited my friend and daughter to sign-up as well. Can't wait to get started! I'm excited to receive the 7-Day Doubt Diet devotions. I'm looking forward to reading your book. This is totally what I need in my life right now! Thank you sooo much! I just pre-ordered your book and can't wait to "dig in". I will also be seeing some awesome Christian women this evening at our weekly Women's Ministry meeting at church and you better believe, I WILL SHARE!!!! Thank You Thank YOU!! Cant wait! Hoping for change in my life filled with self doubt. Thank you for sharing your gifts with us! I'm in and can't wait!! Thanks, Renee. I loved the Encouragement for today devotional titled "Getting Up Again". I posted it to the 1Peter3Living Yahoo group I belong to which is a wonderful group for Christians in spiritually unequally yoked marriages. Some of us who willfully entered into these unequally yoked marriages were just discussing our having failed God in getting into our unequally yoked marriages and after having sought forgiveness for that choice, how we now move forward to being the wives God intends us to be (1Peter3) while living with the consequences from our choice and allowing God to use the place we are in now to grow us and mold us to be more Christ like. The group is a real blessing and I thought your devotional was a very encouraging and timely. I just found your site/blog and am so excited about it. Yes; I want to lose the "weight" of doubt, and clutter, too! They may go hand in hand. I'm a self doubter and I signed up for the 7 day diet devotions...I can't wait! This is just the encouragement I needed today. Your devotion about replaying our failures in our minds really spoke to me. I knew that God was speaking directly to me. I have been battling the enemy all week long over a past regret that I can do nothing about. Praise God that He will give me the victory. Signed up for the 7 day diet and will definitely share this with friends! Just started a blog to encourage moms to keep God at the center of their lives. I already feel satan trying to discourage me from what I feel God calling me to do. So i would love to get the book! This study is coming out at a great time - my 50th birthday. I am signed up and ready! looking forward it. Signed up and ready! Looking forward to your book as well. Just signed up! Perfect timing for where I am in my life. Can't wait:). And winning would be such a blessing! I am so excited for your book to come out. Your other books have been awesome and benefical to me. Thank you for encouraging us daily! Hi I've signed up for the 7 Day Doubt Diet and invited some friends to join me! Can't wait to try it out! Love your posts on your A Confident Heart Page, they encourage me so much! Count me in!!! I can't wait to read the entire book! I love following your comments on A Confident Heart on FB, they are so encouraging, I cannot wait to read the entire book. My name is Cathy Pressley. I have signed up for the 7 day doubt diet. My email address is faithisbelieving03@yahoo.com. i really enjoy proverbs 31 because it really encourages me. Would love to read your book. I printed the Bible verses for reference and plan to share with my Aunt Sharon. Very excited about this, count me in! This sounds just like what I need in my life right now. Can't wait to read the book.